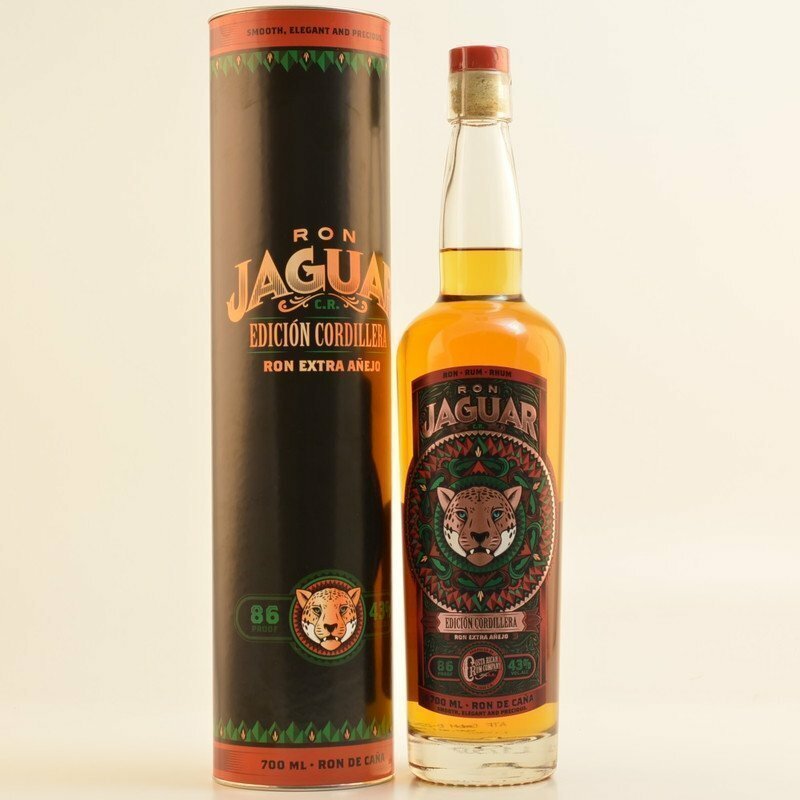 Have you found an online vendor selling Costa Rica Rum Company S.A. Ron Jaguar Edicion Turrialba - Cordillera Ron Extra Añejo? 20ml uit een advent kalender. Karamel, alcohol, hout. Niet erg complex. Palate: well balanced, oak, slightly sharp but smooth at the same time, very aromatic too, somewhat light, but still with a good aftertaste. Would like to have another sip. Light on nose, medium sweet rum with nicely intergrated alcohol with special coca and herbal taste. Nice body, medium plus-length. Taste with tones of brown sugar and gingerbread. Svag doft av vanilj och apelsin. Smaken är inte så speciell men den slinker ner ganska lätt. Meget god rom med duft og smag af tobak, vanille og appelsin. No 24 in my christmas kalender. Not the most exciting scent when it first hits the nose, but it covers that a bit in the taste, not the most tasting rum. Dette er den mindre sprittede udgave af Ron Jaguar edicion Poas Cordillera cask Strength, og det klæder den. Man får mulighed for at smage meget mere. Dufte af appelsin, tobak og træ. Appelsin og vanilie i smagen. Hvis man skulle sætte en finger på den, så er det, at den måske mangler lidt dybde og lidt mere karakter. Men absolut en godkendt rom. 24. December i romkalenderen 2017. Což znamená, pořád ta podivná složka vůně, která připomíná terpentýn, jen slabší. V chuti už naštěstí téměř není patrná. Trochu medová chuť a samozřejmě jemnější než u svého silnějšího sourozence. Ale celkově stále jen průměr. Zehn jähriger Melasse Rum. 43% Vol. In der Nase, von hellen Tabak umwickelte Trockenfrüchte die frisch auf ein Fass geklebt sind. Das Ganze wird dann noch von warmen Karamell übergossen, mit Schokostreusel dekoriert. Im Gaumen beisst zuerst die alkoholische Schärfe in die Zunge, wird aber gleich von eleganten Aromen wie Vanille, Karamell, Kakao und Gewürzen geschmeichelt. Im Abgang lang und nach fruchtiger Schokolade. Ist einiges eleganter als sein 65% Vol. Bruder. Für Einsteiger und Entdecker. Ten year old molasses rum. 43% Vol. In the nose, dry fruits wrapped in light tobacco, which are freshly glued to a barrel. The whole thing is then doused with warm caramel, decorated with chocolate sprinkles. The palate bites first the alcoholic sharpness in the tongue, but is flattered by elegant flavors such as vanilla, caramel, cocoa and spices. In the finish long and like fruity chocolate. Is a lot more elegant than his 65% Vol. Brother. For beginners and explorers.